For those of you that have already checked out the Blues Guitar Theory Guide, you will notice that there are a lot of similarities between the Country and Blues genres. 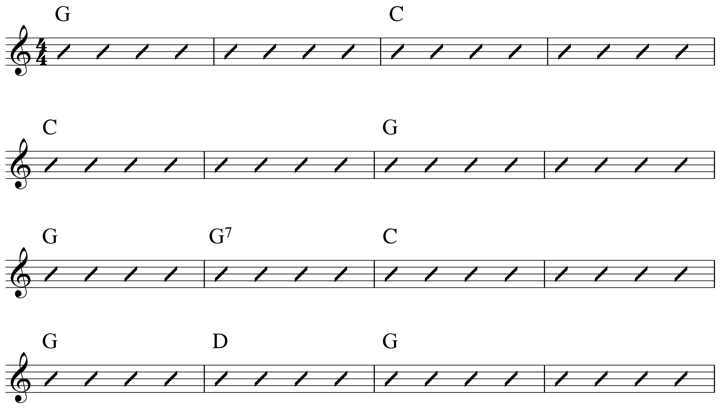 Both of these genres use similar chord progressions, scales and chord fingerings as they rely heavily on major and minor blues scales and Dominant 7th sound in their riff and chord construction. ➥ To learn more about Minor Pentatonic Scales, how they are built, when you can use them in your country guitar solos and how to finger them on guitar, check out What Are Minor Pentatonic Scales and the following video lessons : Southern Comfort, Trainbeat Acoustic Slide, Minor Pentatonic Scale. ➥ To learn more about Minor Blues Scales, how they are different from Minor Pentatonic Scales, and how you can use them to enhance your country soloing chops, check out What Are Minor Blues Scales and the following video lessons: Beginner Country Solo, Hot Country, The Blues Scale. ➥ To learn more about Major Pentatonic Scales, how to play them on the fretboard, and when you can switch between Major and Minor Pents, check out What Are Major Pentatonic Scales and the following video lessons : Fast Country Lead, Country Voicing and Chickin' Pickin' Madness. ➥ To learn more about Major Blues Scales, how they are different from Major Pentatonic Scales, and how to use them to bring a swing, jump country sound to your soloing ideas, check out What Are Major Blues Scales. ➥ To learn more about soloing with major and minor pentatonics scales, how they sound similar and different to blues scales, and how to use these scales to outline different country genres in your lines and phrases, check out Minor vs. Major Pentatonic Soloing Application, Solo Challenge - Major vs. Minor Pentatonic Scales and the following video lessons : Fast Country Solo, Country Licks, Hot Country Licks in G.
➥ To learn more about Mixolydian Pentatonic Scales, how these scales differ from major and minor pentatonic scales, which fingerings are best for guitar and how to add them to your country soloing chops, check out What Are Mixolydian Pentatonic Scales and Mixolydian Pentatonic Scale video lesson. ➥ To learn more about Mixolydian Scales, how these 7-note scales differ from pentatonic scales, which fingerings sit best on the fretboard and how to add them to your country guitar solos, check out What is the Mixolydian Mode, Mixolydian Soloing Concepts for Guitar and the following video lessons: Country Chops & Double Stops, Country Picking, Hybrid Rhythm, Stylish Country, Rockabilly Rhythm, Introduction to the Mixolydian Mode. ➥ To learn more about Ionian Scales, how this mode differs from pentatonic scales, which fingerings are best on the guitar and how to add them to your country guitar solos, check out What is the Ionian Mode, Ionian Soloing Concepts for Guitar and the following video lessons: Ballad Country Solo, Modern Country, Single String Ionian Workout. ➥ To learn more about the Aeolian Mode, how it is different from other 7-note modes, which fingerings sit best on the fretboard and how to add them to your country guitar solos, check out What is the Aeolian Mode, Aeolian Soloing Concepts for Guitar. ➥ To learn more about double stops, 3rd and 6th intervals, and how to use them in your country playing, check out How to Build Major Intervals and How to Build Minor Intervals. ➥ To learn more about Dom 7th Arpeggios, how these shapes differ from scales, which fingerings are best for various octave shapes, and how to mix them with your blues scale ideas when soloing, check out How to Build Dominant 7th Arpeggios and Double Stop Lick video lesson. ➥ To learn more about Dom 9th Arpeggios, how these shapes differ from 7th arpeggios, which fingerings are best for these arpeggios on the fingerboard, and how to mix them with your scale ideas when soloing, check out How to Build Dominant 9th Arpeggios. ➥ To learn more about m7th Arpeggios, how these shapes differ from 7th arpeggios, how to play them on guitar, and how to apply them to your solos, check out How to Build m7th Arpeggios. 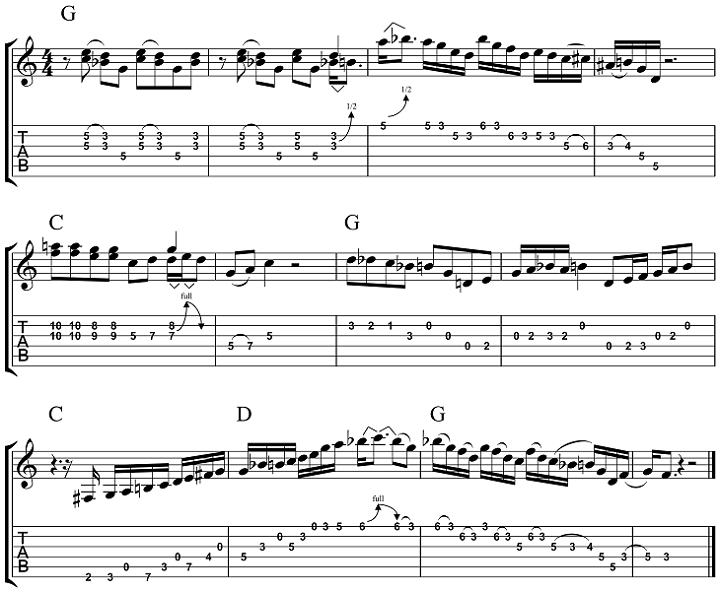 ➥ To learn more about m9th Arpeggios, how these shapes differ from m7th arpeggios, which fingerings are best for these arpeggios on the fingerboard, and how to use them in your blues soloing ideas, check out How to Build m9th Arpeggios. ➥ To learn more about Dom 7th Chords, how they differ from Dom 7 arpeggios on the fretboard, what chord inversions are, and how to mix them with your triads when comping, check out How to build 7th Chords for Guitar and the following video lessons: Country Rhythm in A, 7th Chords. ➥ To learn more about Dom 9th Chords, how they differ from 7th chords on the fretboard, how to play them on guitar, and how to apply them to a jazz blues context, check out How to build 9th Chords for Guitar. ➥ To learn more about 7#9 Chords, how to use them in your blues playing, where they fit best in a blues form and how to finger these chords on guitar, check out How to build 7#9 Chords for Guitar. ➥ To learn more about m7th Chords, how these shapes differ from 7th chords, which fingerings are best for these chords on guitar, and how to apply them to chord progressions, check out How to Build m7th Chords. ➥ To learn more about m9th Chords, how these shapes differ from m7th chords, which fingerings are best for these chords on the fingerboard, and how to mix them with m7th chords over a minor blues, check out How to Build m9th Chords. ➥ To learn more about Major Blues Chord Progressions, what Roman Numerals are, and how to transpose these important chords to different keys, check out Major Blues Chord Progression Theory and the following video lessons : Blues Shuffle, Blues Rhythm Guitar. ➥ To learn more about the I IV V Chord Progression, how it is constructed and how you can add these changes to your playing, and learn to solo over this series of chords, please visit the What is a I IV V Chord Progression lesson page, Johnny Cash Style video lesson, and cool variatons of this progression with the Bon Jovi Country Lesson and Travis Picking Lesson. ➥ To learn more about the I vi IV V Chord Progression, how it is built and how you can solo over this series of chords, please visit the What is a I vi IV V Chord Progression lesson page, as well as a cool variation of this progression with the Country Rhythm Lesson.